Hinduism is an umbrella term for various religious traditions that originated in India, and now are practiced all around the world, though more than 90 percent of Hindus are found in India. The third largest organized religion in the world, after Christianity and Islam, Hinduism is based on the teachings of the Vedas, ancient scriptures, many of which were brought to India around 1500 B.C.E. by the Aryans. The social stratification of the Aryan society also influenced India, and along with Hinduism, a number of social classes, called castes, simultaneously developed after the Aryans' arrival. Just as Hinduism includes a variety of religious traditions, it also has a variety of different types of religious leaders. According to the strict interpretation of the caste system, all priests must come from the highest, or Brahman caste. Throughout his life, a person remains in the same caste into which he was born throughout his life, with the possibility to be born into a higher caste at his next reincarnation, which means in many cases, the priesthood is hereditary. Besides the Priests, Hinduism also has ascetic monastic orders, referred to as Sannyasa, members of which are also primarily from the Brahman caste. A third category of religious leaders in Hinduism are asacharya or gurus, teachers of divine personality who have come to the earth to teach by example, and to help ordinary adherents to understand the scriptures. Since Hinduism includes a variety of gods, religious practices, and religious leaders, each person's faith is an individual matter, and each will choose a form of devotion and a spiritual leader that suits the goals and nature of his faith. All of these religious leaders have a responsibility to guide those who follow them and look to them as examples, to live and teach an upright and holy life. The various religious traditions practiced in India and referred to as Hinduism have their roots in an ancient religion based on the Vedas, that came to India along with the invading Aryans around 1500 B.C.E. One aspect of Hinduism that is based on Aryan society is the caste system, a hierarchy of socioeconomic categories called varnas (colors), made up of priests, warriors and commoners as recorded in the Rigveda. Brahmans, the priests and religious officials, teachers of the sacred knowledge of the veda. Rajanyas, composed of rulers and warriors. People in these three varnas are permitted to study the Vedas and have the possibility to be reborn into a higher caste, eventually reaching enlightenment or Moksha. Shudras, the lowest caste, were not permitted to study the vedas, and had their own religion and priests. Untouchables, who performed tasks too dirty for others, including hunters and butchers. The name for the priestly or Brahman caste, appears to have originally denoted the prayers of the priests, but was eventually adopted to designate the priests themselves. Brahman is often spelled Brahmin to distinguish it from another meaning of Brahman, a term referring to the Hindu concept of ultimate reality, or universal soul. The Brahman caste has been instructed by the Hindu scriptures to devote themselves to studying the scriptures, pure conduct and spiritual growth. Although the Brahman caste is ranked the highest in the varna system, they are not the richest class. Very often members of the Rajanya caste of rulers and warriors have are wealthier. Originally the Brahman caste was instructed to subsist mainly on alms from the rest of society. In addition to studying the scriptures, Brahmans serve the Hindu society as priests, fulfilling a variety of social and religious functions. In the Hindu concept of rebirth, the final steps toward Moksha or salvation, can only be made by members of the Brahman class. Some male members of the Brahman class join spiritual orders called Sannyasa and pursue an ascetic life of spiritual pursuit. Still other members of the Brahman caste find spiritually calling as Gurus, or teachers. Successful Gurus may gather large followings, and sometimes form new branches of Hinduism. Hindu priest placing garlands of fresh flowers on the head of a massive statue of the god Shiva's bull Nandi. Birth: Ceremonies the well-being of the mother during pregnancy to provide for the healthy development of her child, as well as ceremonies for a safe birth, and for bestowing the child's name. Birthdays, including special ceremonies for a child's first birthday, and coming of age. Marriage, including rituals that the priest performs at the family home the day before the wedding ceremony. Purification ceremonies for removing negative influences from newly purchased homes or other properties. Death: Last rites ceremonies, and other rituals to help the deceased to pass over peacefully. Hindus who have taken vows to follow spiritual pursuits are referred to as Sannyāsa (Devanagari: संन्यास), and are members of the renounced order of life within Hinduism. This is considered the topmost and final stage of the varna and ashram systems and is traditionally taken by men at or beyond the age of fifty years old or by young monks who wish to dedicate their entire life towards spiritual pursuits. 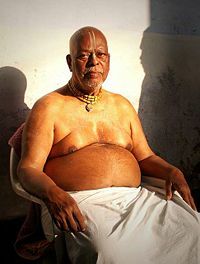 One within the sannyasa order is known as a sannyasi or sannyasin. Saṃnyāsa in Sanskrit means "renunciation," "abandonment." It is a tripartite compound; saṃ-, means "collective," ni- means "down" and āsa is from the root as, meaning "to throw" or "to put," so a literal translation would be "laying it all down." In dravidian languages, "sanyasi" is pronounced as "sannasi." Sannyasin sometimes carry a 'danda', a holy staff. In the Varnashrama System or Dharma of Sanatana Dharma, the 'danda' (Sanskrit; Devanagari: दंड, lit. stick) is a spiritual attribute and symbol of certain deities such as Bṛhaspati, and holy people carry the danda as a marker of their station. 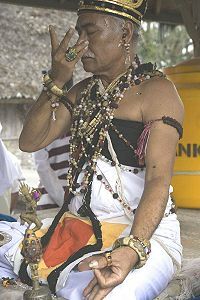 Sri Ananta Das Babaji Maharaja, a leading Hindu religious figure in the contemporary Gaudiya Vaishnava tradition. There are a number of types of sannyasi. Traditionally there were four types, each with a different degree of religious dedication. More recently, sannyasi are more likely to be divided into just two distinct orders: "ekadanda" (literally single stick) and "tridanda' (triple rod or stick) monks. 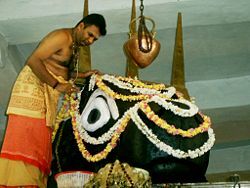 Ekadanda monks are part of the Sankaracarya tradition, and tridanda monks are part of the sannyasa discipline followed by various vaishnava traditions, which has been introduced to the west by followers of the reformer Siddhanta Sarasvati. Each of these two orders have their own traditions of austerities, attributes, and expectations. The sannyasi lives a celibate life without possessions, practises yoga meditation — or in other traditions, bhakti, or devotional meditation, with prayers to their chosen deity or God. The goal of the Hindu Sannsyasin is moksha (liberation), the conception of which also varies. For the devotion oriented traditions, liberation consists of union with the Divine, while for Yoga oriented traditions, liberation is the experience of the highest samadhi (enlightenment). For the Advaita tradition, liberation is the removal of all ignorance and realizing oneself as one with the Supreme Brahman. Among the 108 Upanishads of the Muktika, 23 of them are considered Sannyasa Upanishads. The term is generally used to denote a particular phase of life. In this phase of life, the person develops vairāgya, or a state of determination and detachment from material life. He renounces all worldly thoughts and desires, and spends the rest of his life in spiritual contemplation. It is the last in the four phases of a man, which are referred to as brahmacharya, grihastha, vanaprastha, and finally sannyasa, as prescribed by Manusmriti for the Dwija castes, in the Hindu system of life. These four stages are not necessarily sequential. One can skip one, two or three ashrams, but can never revert back to an earlier ashrama or phase. Various Hindu traditions allow for a man to renounce the material world from any of the first three stages of life. Unlike monks in the Western world, whose lives are regulated by a monastery or an abbey and its rules, most Hindu sannyasin are loners and wanderers (parivrājaka). Hindu monasteries (mathas) never have a huge number of monks living under one roof. The monasteries exist primarily for educational purposes and have become centers of pilgrimage for the lay population. Ordination into any Hindu monastic order is purely at the discretion of the individual guru, or teacher, who should himself be an ordained sannyasi within that order. Most traditional Hindu orders do not have women sannyasis, but this situation is undergoing changes in recent times. 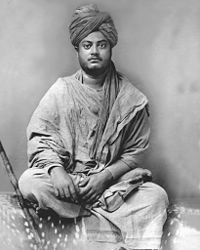 Swami Vivekananda (1863-1902) an Indian Hindu sage of the nineteenth century, in Jaipur. Another important leadership aspect in Hinduism is the guru-shishya tradition, a spiritual relationship where knowledge is transmitted from a guru (teacher, गुरू) to a 'śiṣya' (disciple, शिष्य) or chela. The nearest word in English for guru is "great." Related words in Sanskrit are Guruttar and Garishth, which have meanings similar to greater and greatest. Hinduism emphasizes the importance of finding a guru who can impart transcendental knowledge, or (vidyā). Such knowledge, whether it be vedic, agamic artistic, architectural, musical or spiritual, is imparted through the developing relationship between the guru and the disciple. It is considered that this relationship, based on the genuineness of the guru, and the respect, commitment, devotion and obedience of the student, is the best way for subtle or advanced knowledge to be conveyed. 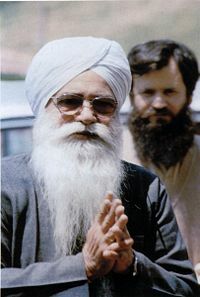 The student eventually masters the knowledge that the guru embodies. In Indian culture, a person without a guru or a teacher (acharya) was once looked down on as an orphan or unfortunate one. The word anatha in Sanskrit means "the one without a teacher." An acharya is the giver of gyan (knowledge) in the form of shiksha (instruction). A guru also gives diksha initiation which is the spiritual awakening of the disciple by the grace of the guru. Diksha is also considered to be the procedure of bestowing the divine powers of a guru upon the disciple, through which the disciple progresses continuously along the path to divinity. Parampara is the word traditionally used in ancient Indian culture for a succession of teachers and disciples. In the parampara system, knowledge (in any field) is believed to be passed down from teacher to student through successive generations. The Sanskrit word literally means an uninterrupted series or succession. Sometimes defined as "the passing down of Vedic knowledge" it is believed to be always entrusted to the teachers, or ācāryas. An established parampara is often called sampradāya, or school of thought. For example, in Vaishnavism a number of sampradayas are developed following a single acharya. While some argue for freedom of interpretation others maintain that "[al]though an ācārya speaks according to the time and circumstance in which he appears, he upholds the original conclusion, or siddhānta, of the Vedic literature." Beginning in the early oral traditions of the Upanishads (c. 2000 B.C.E. ), the guru-shishya relationship has evolved into a fundamental component of Hinduism. The term Upanishad derives from the Sanskrit words upa (near), ni (down) and şad (to sit)—so it means "sitting down near" a spiritual teacher to receive instruction. The relationship between Krishna and Arjuna in the Bhagavad Gita portion of the Mahabharata, and between Rama and Hanuman in the Ramayana are examples. In the Upanishads, gurus and shishya appear in a variety of settings (a husband answering questions about immortality, a teenage boy being taught by Yama, the Hindu Religion's Lord of Death, etc.) Sometimes the sages are women, and the instructions may be sought by kings. Gurudakshina, where the shishya gives a gift to the guru as a token of gratitude, often the only monetary or otherwise fee that the student ever gives. The traditional gift was a cow, a gift of great value, since cows are sacred to Hindus. The tradition has evolved over time, and each student chooses a gift that he feels is appropriate, which may range from a simple piece of fruit to a sizable financial donation toward the guru's work. Lahiri Mahasaya (1828-1895), was an Indian yogi and a disciple of Mahavatar Babaji who revived the yogic science of Kriya Yoga. Sri Anandamoyi Ma (1896-1982), a spiritual teacher (Guru), saint and a mystic from Bengal, one of prominent mystics of the twentieth century. Narayan Maharaj (1885-1945) was a Hindu Indian spiritual master considered by his followers to be a sadguru, or true teacher. A priest at the Kapaleeshwar Temple, the oldest temple in Chennai, India. 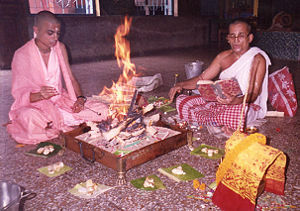 A Brahman priest tends to the ceremonial fire at a Hindu wedding. ↑ Hindu Priest.net - For the journey ahead Retrieved October 7, 2008. ↑ 3.0 3.1 Satsvarupa Dasa Goswami. Readings in Vedic Literature: The Tradition Speaks for Itself. (Bhaktivedanta Book Trust, 1985, ISBN 0912776889). ↑ Sri Guru Ravi Das ji website. Retrieved October 7, 2008. Goswami, Satsvarupa Dasa. Readings in Vedic Literature: The Tradition Speaks for Itself. Bhaktivedanta Book Trust, 1985, ISBN 0912776889. Thekkudan, Anto P. Sannyasa And Spiritual Formation in Hinduism. Alwaye, India: St. Thomas Academy for Research, 1988. 'The Song of the Sannyasin', poem by Swami Vivekanandaariseawake.com. The Internal Meaning of Sannyasa gosai.com. Encyclopedia for Epics of Ancient India: Brahmanmythfolklore.net. This page was last modified on 24 December 2017, at 20:58.